Double Dragon IV perfectly replicates the “old school” look and feel of the series’ origins. It’s the latest throwback to the neon-tinged 1980’s, as game developers continually peruse the catalog of dormant franchises. It’s nice – every once in a while – to cozy up with an old friend; and while Double Dragon IV isn’t progressive or groundbreaking, it earns points for paying homage to a legacy franchise that many 30-somethings remember fondly. If you have played Double Dragon on the Nintendo Entertainment System, and you want more of that, then Double Dragon IV will fill your needs. From the start, Arc System Works, the developer of Double Dragon IV, appeals to your sentimentality. The title screen blasts familiar music, as the wave of nostalgia pounds you in the face like a jackhammer takes to concrete. The soundtrack is killer. What’s more, it’s faithful to the Double Dragon heritage, as Arc System Works has ensured that you will be humming along as you punch and kick ne’er-do-wells into blinking oblivion. The soundtrack is on point, as it feels true to its roots but not outdated. The game play hasn’t evolved much – except that Arc System Works added inexplicable and unnecessary platforming segments to Billy and Jimmy Lee’s to-do list. While most segments are brief and painfully easy, some areas in the later stages of the game will test your patience. 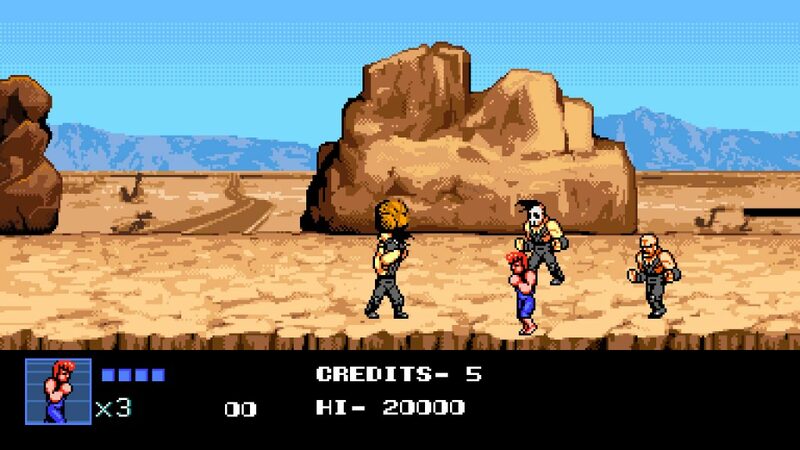 Despite their prowess in the martial arts, Billy and Jimmy, the Double Dragon, aren’t the most precise or able platformers around, so falling into a pit is surprisingly easy and terribly frustrating. 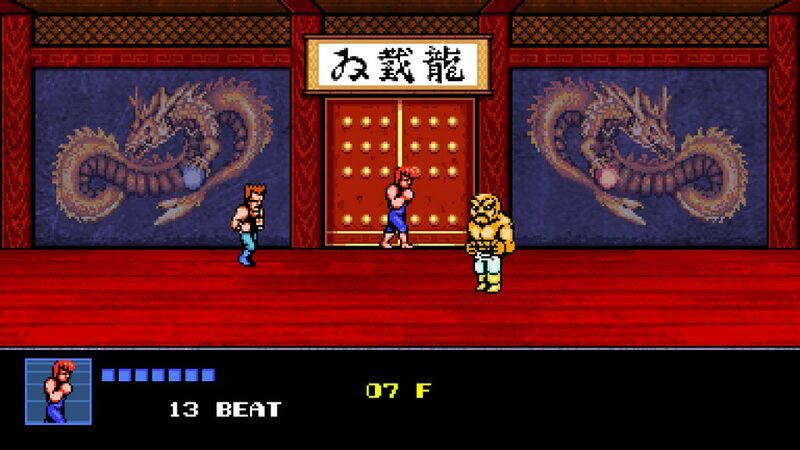 Double Dragon IV, like its predecessors, isn’t an easy game (to be good at), given the plodding nature of the combat. You need to protect credits like a dragon guarding a cave full of jewels and gold coins. If you play alone, it’s hard to beat every story mission — or even get to the final mission. Par for the course, you punch and kick (and roundhouse kick) your way through an army of oddly similar villains. I feel sorry for the woman who has given birth to multiple Abobos. Each mission is short, which helps balance the difficulty; however, without a block button to deflect attacks, it’s hard to stay on your feet. Oftentimes, enemies encircle you like a pack of hyenas, which means that, without a block button, you’re exceedingly vulnerable. Double Dragon IV needs a block button. During numerous brawls, you fight two or three boss characters, and a block button would help even the odds. You can’t save during the game, so if you lose all of your credits, then you have to start again from mission one. If you manage to finish mission 12, then you unlock Tower Mode, which tests your skills against floors and floors (and floors) of enemies. In Tower Mode, you have zero continues. While this unlockable mode adds replay value and challenge to Double Dragon IV, Tower Mode doesn’t change the fact that the main game, Story Mode, is oftentimes more frustrating than fun. Enemies, for instance, sometimes wait atop ladders and attack you as soon as you climb up. Double Dragon IV is faithful to the original game, so Arc System Works deserves credit for authenticity. Who doesn’t remember the disembodied Micky Mouse hand guiding you to the next area? Who doesn’t remember standing at the edge of the screen and punching (or kicking) until the last enemy is finished? The Double Dragon series is fun to revisit, but the formula gets old after one or two trips through the grinder. If you want the best experience, then you need to bring a friend to the fight. Double Dragon IV features couch co-op, which is definitely the best way to play an “old school” brawler. Friends make life better, and a friend can help you tear through grunts and boss enemies like a flock of ravenous seagulls. Double Dragon IV offers online cooperative play via Share Play — but it is available only to PlayStation 4 users. Share Play is hidden within the Share menu, and given that there’s no online option on the title screen, some players might assume that online play is not available. Arc System Works can’t assume that everyone knows how to find the Share Play feature — or that it’s available in a game. Double Dragon has always been best in small chunks, so you can play Double Dragon IV without much commitment; however, nostalgia carries enthusiasm only so far. Double Dragon IV deserves no more than an hour of your attention. It’s nice to dip your toes in the water, but the pool is shallow – despite its rocking soundtrack. Imagine that you’re blasting Kenny Loggins’ “Danger Zone” while trying to enjoy an inflatable kiddie pool. We often have reverence for classic games, but few of these games offer enough depth to keep our attention. Double Dragon IV honors its roots, which is good – until you realize that you’ve played a nearly identical game. For some, the price — $6.99 — is right, and Double Dragon, as a series, deserves our respect; however, Double Dragon IV does nothing but prey on nostalgia. Disclaimer: Arc System Works provided a review code.